What comes to mind when you hear “baklava”? Greek festivals, sweet pastry, honey and nuts? This Mediterranean confection has been enjoyed for centuries, through invasions, economic woes, and even world wars, so we’re going to plunge into the history of this fascinating dessert. Learn about local baklava customs, how the ancients created the original versions, and how you can make your own baklava — sticky fingers and all. Opa! ​​Gaziantep, Turkey, famous for its baklava, is widely regarded (at least among Turkish people) as the native city of the traditional sweet. In 2008, the Turkish patent office registered a geographical indication certificate for Antep Baklava. Cyprian baklava in Café Europe led to so-called "Baklava War"
In the cultural initiative Café Europe, baklava was chosen to represent Cyprus in the "Sweet Europe" presentation. This led to the "Baklava War," with Turks proclaiming that baklava is Turkish. "Shape the placenta as follows: place a single row of tracta along the whole length of the base dough. This is then covered with the tracta mixture from the mortar. Place another row of tracta on top and go on doing so until all the cheese and honey have been used up. Finish with a layer of tracta. Place the placenta in the oven and put a preheated lid on top of it. When ready, honey is poured over the placenta." Their recipe started with thin layers of bread dough, with chopped nuts between the layers, and honey poured over the top after baking. This dish was only prepared for special occasions, and was only available to the rich until around the mid-19th century. Baklava, once a dish so special it was only considered fit for the rich, is popular around the world today. Many countries, including Lebanon, Armenia, Turkey, and Greece have their own regional variations of baklava, and prepare it for festivals and other special occasions. Choose a country whose baklava style you respond to, and adopt one of their festivals or customs for your own pleasure. For example, Muslims in the Balkan region typically prepare baklava during Ramadan, while Christians in the same area make it for Easter and Christmas; for the Easter version, baklava is made with 40 layers of dough to represent the 40 days of Lent. During this time of the year, there is a multitude of cultural festivals to enjoy, including many where baklava can be found in abundance. A simple Internet search will quickly tell you when the next one is happening near you. Think of the baklava experience in much the same way as tasting a fine wine. First, contemplate the beauty that is baklava on your plate, then pierce it with your fork so that one third of the piece is behind the fork and the other two thirds are facing you. (This should prevent the piece from breaking in half.) 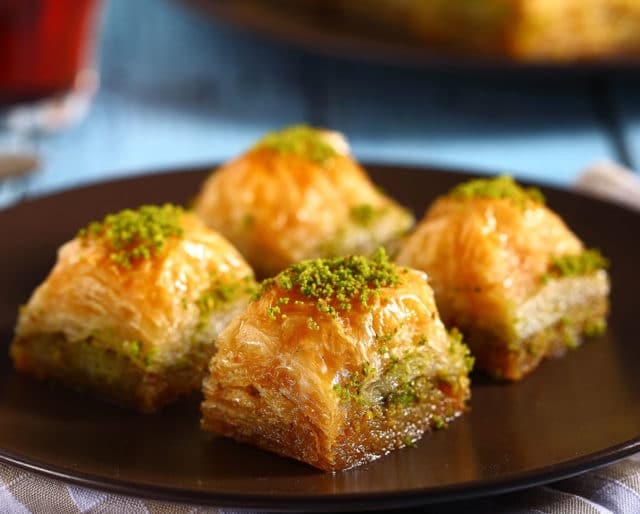 Take time to notice the aroma as you lift your baklava-filled fork, slowly take a bite, then savor the taste as it melts on your palate. Cardinal social sin: cutting through the layers of baklava. Since the labor involved in hand-making phyllo dough is quite daunting, it makes sense to use prepared phyllo dough (available at most grocery stores), as long as you have at least 30 layers. Place a layer of phyllo dough in a large baking pan, brush it with melted butter, then add another layer, brush with butter, and repeat this process for several more layers. After building up several layers of butter-brushed phyllo, add a layer of finely-chopped nuts (walnuts, pistachios, and hazelnuts are most common), then continue layering pastry and brushing with melted butter, adding more nut layers as desired. ​When all your layers are in place, before baking, cut the baklava into individual pieces; a parallelogram (lozenge) shape works well. ​Bake at 350°F for about 30 minutes, until lightly browned, and while hot, pour honey or syrup liberally over the entire pan, allowing it to soak through all layers, and try to wait for it to cool slightly before eating. We can't think of any other kind of sweet concoction that's similar to baklava. It has many ultra-thin pastry layers like croissants, nuts like a coffee cake, and honey like a sticky bun, yet baklava is not at all like any of these things. It's in a delicious little pastry world all its own. Just thinking about baklava conjures up long, warm summer evenings on a Greek island, watching the sun set over the turquoise sea while sipping tea, and indulging in a second helping of freshly-made baklava. If we really have to have a reason to enjoy baklava, let it be this: because it's sweet but not too sweet, a bit crispy but also tender, and it's exotic and foreign, yet mysteriously familiar.